Not only do new church starts in significant numbers bring systemic change and renewal to mainline denominations, but new church development brings similar change to individual aging congregations in their vicinity. Author Stephen Compton argues that a decline in new church starts in the last half of the 20th century--not liberalism or lack of faith, as is often cited--was the major contributor to the decline of mainline church groups. He shows in this book how introducing considerable numbers of new congregations into these old denominations can cause these venerable institutions to revisit the meaning of "church" and "congregation"; develop a clearer vision of their collective mission, and grow in their ability to bring about positive change in the world. In effect, he contends, new churches in an aging organization do not merely make it grow. They make it change in ways that make it more effective in its mission and ministries. 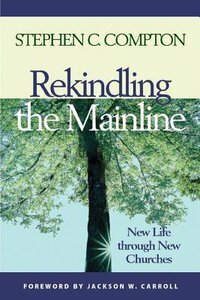 This book will appeal to leaders across denominational lines, including those not ordinarily called "mainline, " and especially to pastors and leaders of older congregations. Stephen Compton is the former dean of the Duke National Institute for New Church Development. Since 1989, he has served the United Methodist Church as a regional staff member responsible for the formation of new churches, and as a consultant and trainer for as many as 60 older congregations a year. He has also served as a national consultant and trainer in the field of congregational development and new church development.